When I last visited San Cristobal de las Casas, I was most impressed by the women. In my travels throughout Mexico, this was the place to see a large representation of women from villages spread throughout the area, from the lowlands, jungles and mountain villages. Each garment worn by a woman represents where she is from. Since my visit there, the Centro de Textiles del Mundo has been built that showcases 500 examples of handwoven textiles from throughout Mexico and Central America. Two permanent exhibit rooms display huiples (the sleeveless tunics you will see the women wearing throughout Mexico), including a 1000-year-old relic fashioned from tree bark. Chiapas is a fascinating state with seven ecosystems. It has one of the thickest rain forests in the country along with jutting mountains and accompanying valleys, dense pine forests, and some of the most stunning archeological sites found in Mexico. Floating along the river to the entrance of Xaxchilan and climbing into the jungle, guided by the sounds of the howler monkeys, remains as one of my favorite memories. Here is a great photo of mi amiga, Ane Elena Martinez and me sitting on the steps of another ruin, Bonampak. Yes, it was very hot and, yes, my hair was dark then. This ruin is located in the Montez Azules Biosphere reserve and is proudly taken care of by the Lacandons who live nearby. We were privileged to visit their village, Lacanja and walked through the jungle to visit the waterfall near the Lacanja River. Another fabulous site is Palenque, which is a must see if you have time, stopping to see the stunning Agua Azul with its many cascading waterfalls. 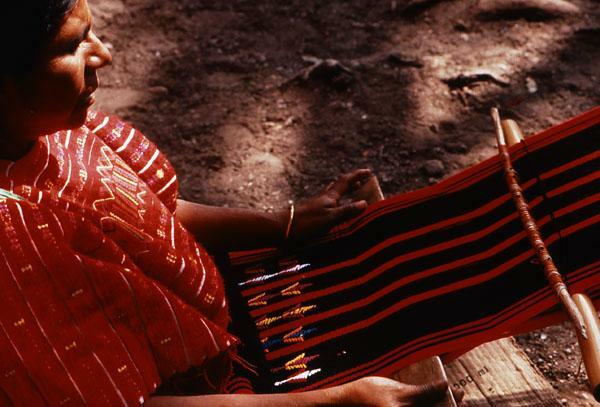 Women using back strap looms are seen wherever we visited. It's amazing what you can do with some yarn and a couple pieces of wood. We visited the weaving village of Zincantan, the name meaning "bat's place" and once was home of renowned traders of amber, quetzal feathers and jaguar skins. This family was just enchanting and proudly shot off their home made fireworks for our group. Local guide, Gaby introduced us to Sergio Castro who has been providing treatment for burns to native villagers for years. He has a private museum displaying the distinctive clothes of different Chiapencan indigenous groups. I'm looking forward to seeing any new additions. Ane Elena is a pastry chef and cateress and she pointed out that here you can find beans that you can't find anywhere else in Mexico. The local markets are always fun to wander through and here you can find some wonderful candles. Although San Cristobal is known for amber and textiles, what I remember most vividly is meeting Ambar Past who founded the Mayan women collective Taller Lenateros. She felt it was important for the women to have the opportunity to remember their heritage through poems and papermaking. Their book, Incantantions by Mayan Women is fabulous. When she casually walked us by the room that held the many colorful papers and said that we could purchase whatever we wanted, my heart skipped a beat - many times. I still have some of these beautiful papers. And now we get to make paper with this collective! I am so excited to share this magical place with Katie Kendrick and Judy Wise and the artists who will join us for the Textiles in Chiapas workshop that will be influenced by the women we meet and see in San Cristobal de las Casas. Details for the trip can be found here. If you like to travel with like minded-people, enjoy seeing new parts of the world while traveling with a small group, we'd love to have you join us March 24 - April 2, 2017.